Introduction Screening for atrial fibrillation (AF) in people ≥65 years is now recommended by guidelines and expert consensus. While AF is often asymptomatic, it is the most common heart arrhythmia and is associated with increased risk of stroke. Early identification and treatment with oral anticoagulants can substantially reduce stroke risk. The general practice setting is ideal for opportunistic screening and provides a natural pathway for treatment for those identified. This study aims to investigate the feasibility of implementing screening for AF in rural general practice using novel electronic tools. It will assess whether screening will fit within an existing workflow to quickly and accurately identify AF, and will potentially inform a generalisable, scalable approach. Methods and analysis Screening with a smartphone ECG will be conducted by general practitioners and practice nurses in rural general practices in New South Wales, Australia for 3–4 months during 2018–2019. Up to 10 practices will be recruited, and we aim to screen 2000 patients aged ≥65 years. Practices will be given an electronic screening prompt and electronic decision support to guide evidence-based treatment for those with AF. De-identified data will be collected using a clinical audit tool and qualitative interviews will be conducted with selected practice staff. A process evaluation and cost-effectiveness analysis will also be undertaken. Outcomes include implementation success (proportion of eligible patients screened, fidelity to protocol), proportion of people screened identified with new AF and rates of treatment with anticoagulants and antiplatelets at baseline and completion. Results will be compared against an earlier metropolitan study and a ‘control’ dataset of practices. Ethics and dissemination Ethics approval was received from the University of Sydney Human Research Ethics Committee on 27 February 2018 (Project no. : 2017/1017). Results will be disseminated through various forums, including peer-reviewed publication and conference presentations. Trial registration number ACTRN12618000004268; Pre-results. New technology is used to quickly and efficiently identify and treat atrial fibrillation (AF), within an existing workflow in the general practice setting. General practices are ideally placed to screen for and diagnose AF, as well to provide a pathway to care for those identified during screening. Conducting the study in the rural setting will inform future AF screening policies to extend the evidence base beyond metropolitan settings. A potential limitation is the small size and non-randomised design, which would ideally be overcome in a future large-scale study. With 84% of Australian general practices employing practice nurses,22 there is scope for AF screening to be performed during existing practice nurse health appointments. Ideally, practice nurses could screen patients for AF during the influenza or shingles vaccination and/or coordinated chronic care consultations. These appointments are already funded by the Australian Government: the influenza vaccination is recommended annually and provided free for patients aged ≥65 years23; shingles vaccines will be provided free for people aged ≥70 with a 5-year catch-up programme for people aged 71–7924; annual health assessments are funded for those aged ≥7525; and annual coordination consultations are funded by Medicare for patients with chronic conditions (eg, diabetes, cardiovascular) on a care plan.26 These are all occasions when patients in the target age group are likely to be available and receptive to AF screening, in an appropriate setting. While numerous studies have been conducted in metropolitan areas, there is a paucity of data regarding AF screening in rural areas. A recent systematic review of AF screening studies conducted in rural settings acknowledged the need for more information on AF burden and risk factors specifically in rural areas.27 In the Australian context, it is known that people living in rural areas have worse cardiovascular outcomes.28 It has been reported that there is a lack of evidence about rural cardiovascular disease prevention and ‘characteristics associated with quality of care’, which highlights the need for more programmes in rural primary care, especially for high-risk patients.29 This study aims to implement a screening programme with a quality improvement (QI) focus, to better inform future AF screening policies to extend the evidence base beyond metropolitan settings. This study, Atrial Fibrillation Screen, Management And Guideline Recommended Therapy (AF-SMART II), will investigate the feasibility of implementation of an AF screening and use of an AF electronic decision support tool (EDS), in rural general practices. It is a cross-sectional, observational implementation study of AF screening using a smartphone ECG conducted by GPs and practice nurses in up to 10 rural general practices in New South Wales (NSW), Australia. It is very similar to the study protocol used in the AF-SMART study which was conducted in eight metropolitan general practices in Sydney, Australia from 2016 to 2018. AF-SMART II is a rural extension of AF-SMART with some important modifications based on feedback obtained in the metropolitan study. These modifications include: (1) an improved electronic screening prompt to improve the proportion of eligible patients screened; (2) the introduction of GP continuing professional development (CPD)/QI points to provide additional incentives for GPs; (3) a more structured approach to nurse screening and (4) a shorter screening period. Have at least one practice nurse. Use either ‘Best Practice’ or ‘Medical Director’ as the practice electronic patient record management system. Be willing to have ‘TopBar’ (PenCS third party software) and the clinical audit tool ‘PenCAT’ for data collection installed (licences are provided by the Primary Health Networks, NSW). Kardia device and iECG reading. AF app with screening prompt, which extracts data from the electronic patient record and provides a prompt for AF screening when an eligible patient’s file is opened, and allows clinical staff to record the provisional screening results (figures 2 and 3). EDS system, which guides evidence-based treatment of those diagnosed with AF. 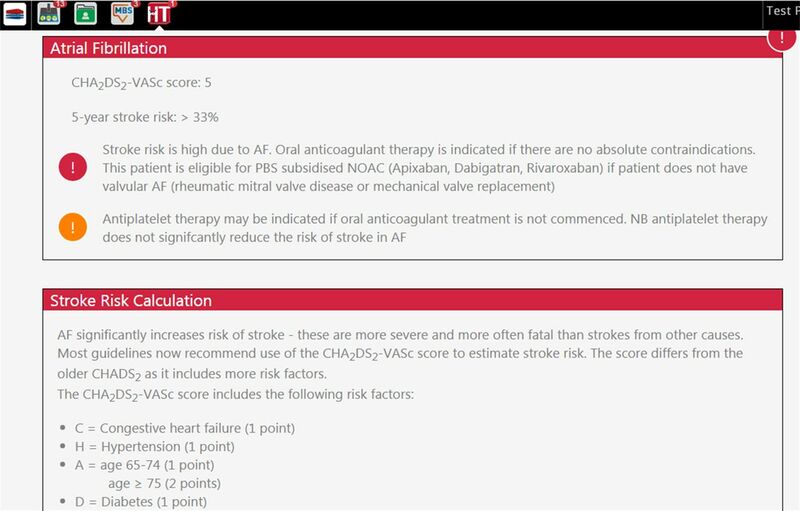 The EDS is a clinically validated QI tool, designed to bridge gaps between evidence and practice in AF risk management.30 The EDS extracts data from electronic patient records regarding current OAC and antiplatelet prescriptions and calculates individual stroke risk scores (CHA2DS2-VASc) (figure 4). It then provides clinical staff with evidence-based medication guidelines to support decisions on OAC prescription. Screenshot showing test patient file and TopBar apps. AF, atrial fibrillation. entering an iECG result in TopBar AF app (test patient shown). AF, atrial fibrillation; GP, general practitioner. Screenshot showing EDS recommendation for test patient. AF, atrial fibrillation; NOAC, novel oral anticoagulant. The apps are located in the TopBar hosting platform that integrates with the general practice electronic patient record management systems. Once the technology set-up is complete, practice nurses and GPs will receive training on the use of the electronic tools and iECG as well as recent developments in evidence-based management of AF for stroke prevention, highlighting guideline recommendations for OAC, and recommendations against using aspirin to treat AF.11 Practices will be provided with posters for the reception area advertising the study and a laminated participant information statement will be available at reception. No current recorded diagnosis of AF. Have not already been screened with the iECG in the past 12 months. Patients with terminal illness and patients unable to provide informed consent will be excluded. The AF screening prompt will notify clinical staff a patient is eligible for iECG screening. The GP/nurse will explain the screening process and purpose, and obtain informed oral consent from patients. The GP/nurse will record a 30 s iECG. The iECG trace will be visible in real time on the phone, and a pdf will also be available to download from the secure Kardia website. An automated interpretation (‘Possible AF’, ‘Normal’ or ‘Unclassified’) is provided immediately after successful recording. The GP/nurse will enter the iECG screening result into the AF app in TopBar. Depending on the iECG result, follow the appropriate protocol. Process flow of AF screening. AF, atrial fibrillation; GP, general practitioner; OAC, oral anticoagulant. The GP/nurse will inform the patient of the diagnosis and give a brief explanation. If the nurse performed the screening, the patient will be referred to their GP. Further investigation and management is at the GP’s discretion, which could include referral to a specialist. A 12-lead ECG is recommended to provide additional confirmation for all new AF diagnoses, and to add extra leads for AF diagnostic workup. In some cases of paroxysmal AF, the 12-lead ECG may show sinus rhythm while the iECG showed AF. This will be obvious from a comparison of the p-waves on the lead I iECG and lead I of the 12-lead ECG, as well as the regularity of the rhythm. Following a 12-lead ECG, for patients with confirmed AF, GPs will be encouraged to use the EDS to review each patient’s CHA₂DS₂-VASc score and commence guideline-recommended treatment to reduce stroke risk. The GP/nurse will inform the patient of the diagnosis. No further action is required. The GP/nurse will inform the patient of the diagnosis and give a brief explanation based on information provided by researchers. Depending on individual patient’s history and iECG, a 12-lead ECG may be recommended by the GP but follow-up is at the GP’s discretion. There are a number of conditions that can lead to this particular diagnosis (eg, sinus tachycardia/bradycardia, left bundle branch block, right bundle branch block or multiple ectopic beats) which may or may not be clinically significant, or previously known. In order to assist in practice recruitment, education and training will be structured to be eligible for CPD points for nurses and GPs. In addition, all practices will be encouraged to use the research project to conduct an AF QI programme that will attract specific QI professional development points. Implementation success through process measures including proportion of eligible patients seen in the practice during the period who are screened (calculated from information available in the de-identified data extracts), fidelity to the protocol and time taken to complete the intervention. Proportion of people screened identified with new AF. Proportion of patients where EDS page accessed. Proportion of eligible patients prescribed OAC as a result of the intervention. Proportion of patients with diagnosed AF prescribed antiplatelet therapy during the study period. Prevalence of AF at baseline (compared with metropolitan and control group, as defined below). Incidence of new AF at completion of the intervention (compared with metropolitan and control group). Rates of treatment with anticoagulants and antiplatelets at baseline and at completion of the intervention (compared with metropolitan and control group). Acceptability, competing demands, barriers and enablers according to staff involved in the intervention. Cost-effectiveness analysis (ie, incremental cost-effectiveness ratio (ICER) of screening per quality-adjusted life year (QALY) gained and per stroke avoided), using data from Cadilhac et al 31 to estimate the present value of QALYs gained for each ischaemic stroke prevented. The study aims to screen approximately 2000 patients in total from up to 10 general practices. Assuming an incidence of 1.4% of people aged ≥65 with unknown AF,32 we estimate 28 new cases of AF would be identified. A sample size of 2000, assuming 1.4% incidence, would provide a 95% CI of 0.93% to 2.02% (18–40 cases). PenCAT will be configured to collect de-identified data from electronic patient records. These data include demographic, medication and diagnostic information. Data extracts will be taken at baseline, end of month 1, end of month 2 and end of month 3. The screening period will be extended if required so that practices get all four data extracts. Following each data extract, feedback will be provided to practices including a summary of results (number screened by each staff member in total and for that month). Following completion of the iECG screening period, selected staff from each practice will be interviewed to gather their feedback as part of a comprehensive process evaluation. Semistructured interviews with selected GPs, practice nurses and practice managers will be carried out by researchers at the end of the screening intervention. The interviews will be audio recorded and transcribed. Descriptive analyses will be carried out both at the individual practice level and all practices pooled together. Data collected in this study will be compared with data collected from the earlier study in metropolitan Sydney, and a database of ‘control’ practices with the same data-parameters collected through concurrent studies run by The George Institute. Analyses of these data will be conducted using SAS v 9.4, with χ2 tests used to test associations between AF incidence and method of detection (screen detected or clinically detected), and two-tail p values<0.05 will be considered significant. A basic economic model for AF screening has previously been developed and used in the SEARCH-AF33 study. 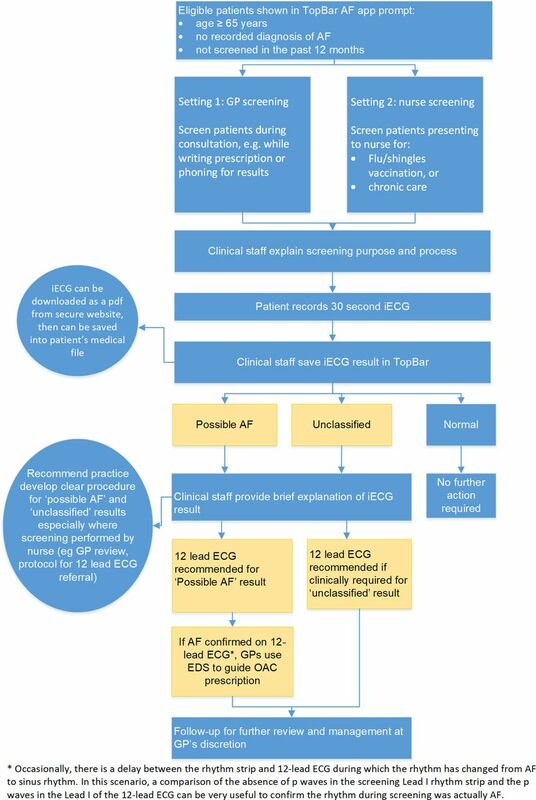 This model will be adapted and extended to evaluate screening for AF by the practice nurse in the general practice. A modelled cost-effectiveness analysis from an Australian health funder perspective will be performed comparing the cost of iECG population-based screening for AF, to diagnosed AF in an unscreened population of Australian men and women aged 65–84 years. Future costs will be discounted at a rate of 5%. The results will be expressed as an ICER per stroke avoided and per QALY gained. A detailed process evaluation using mixed methods will be undertaken to evaluate the iECG screening process. Realist evaluation35 will be used to analyse the interaction of context, mechanisms for change and the outcomes that are produced in both this study and the metropolitan component. In this way, we will piece together a detailed understanding of how the intervention influenced the capacity, opportunity and motivation of providers to improve detection and evidence-based treatment of AF. Development and refinement of the protocol was an iterative process. Feedback obtained through interviews patients, nurses, GPs and practice managers about their experience and preferences during previous AF screening studies,20 21 contributed to the development of the protocol. Following the study, participating practices will be provided with a summary of the findings of the study, together with a full copy of any publications, which will be made available to patients in the practice reception area. The study will comply with the National Health and Medical Research Council ethical guidelines. Participating practices will provide written, informed consent and patients being screened will provide oral consent. We used the Standard Protocol Items: Recommendations for Interventional Trials checklist when writing our protocol report.36 The study will be administered by the Charles Perkins Centre, University of Sydney. Results of the study will be disseminated through various forums, including peer-reviewed publications and presentation at national and international conferences. Screening for AF in people ≥65 years is now recommended by guidelines and international expert consensus.11 16 Importantly, a comprehensive screening programme should include a system to support evidence-based treatment for patients ultimately diagnosed with the condition.16 General practices are well placed to opportunistically screen older patients, and are ideal in terms of the pathway for treatment for those identified. This study will provide electronic prompts for screening and test a patient-level EDS integrated with the practice’s clinical software, to support evidence-based treatment. This study aims to investigate the feasibility of implementing screening for AF in rural general practice. It follows on from the first phase of the study conducted in metropolitan general practice, allowing comparison against a metropolitan setting and a control group of standard practices. The project will assess if screening will efficiently fit within an existing workflow to quickly and accurately identify AF. The study will also explore the effect of GP and practice nurse education, electronic screening prompts and EDS to facilitate evidence-based treatment. In Australia, the Heart Foundation’s Guideline for the Diagnosis and Management of Atrial Fibrillation will be released in August 2018, the draft guideline recommends opportunistic screening for AF in general practice for people aged ≥65 years. This study will potentially have important implications for the implementation of a large scale opportunistic AF screening programme for those aged ≥65 years. It could also inform the design of a future randomised trial of AF screening. It is anticipated that the study will demonstrate that the general practice setting, provided with additional electronic tools, can meet the challenges of large-scale opportunistic screening with a cheap, convenient, scalable solution. Public Health England. CVD: Primary Care Intelligence Packs, NHS South Norfolk CCG. 2017. https://wwwgovuk/government/uploads/system/uploads/attachment_data/file/622956/NHS_East_Riding_of_Yorkshire_CCG_CVD_intelligence_packpdf (accessed 24 Oct 2017).
. Randomised trial of two approaches to screening for atrial fibrillation in UK general practice. Br J Gen Pract 2002;52:373–80.
. iPhone ECG screening by practice nurses and receptionists for atrial fibrillation in general practice: the GP-SEARCH qualitative pilot study. Aust Fam Physician 2014;43:315–9.
. General practice activity in Australia 2015-16: BEACH: bettering the evaluation and care of health. Sydney: Sydney University Press, 2016. Media Release, Prime Minister and Minister for Health. Ground-breaking flu vaccines to protect millions of Aussies. 2018. http://www.health.gov.au/internet/ministers/publishing.nsf/Content/health-mediarel-yr2018-hunt020.htm (accessed 9 Mar 2018). NSW Government. Shingles vaccination program 2018. http://wwwhealthnswgovau/immunisation/Pages/Shingles-programaspx (accessed 9 Mar 2018). Australian Government Department of Health. Health assessment for people aged 75 years and older. 2014. http://wwwhealthgovau/internet/main/publishingnsf/Content/mbsprimarycare_mbsitem_75andolder (accessed 19 Mar 2018). Australian Government Department of Health. Chronic disease management - provider information. 2016. http://wwwhealthgovau/internet/main/publishingnsf/content/mbsprimarycare-factsheet-chronicdiseasehtm (accessed 9 Mar 2018). Australian Institute of Health and Welfare (AIHW). Cardiovascular medicines and primary health care: a regional analysis. Canberra: Australian Institute of Health and Welfare, 2010.
. Community screening programs to identify unknown atrial fibrillation: a systematic review. Eur Heart J 2012;33:61.
. Realistic evaluation. London, UK: Sage Publications, 1997. Contributors LN, BF, NL and JO conceived the original concept of the study. JO, LN, NL, BF, CMH, CF, RG and NZ were involved in the design of the study. LN provided qualitative analysis expertise and NL provided cost-effectiveness analysis expertise. RW and AP were involved in the design and testing of the electronic study apps and provided statistical expertise. JO, LN, BF, JL and NL were involved in drafting the article. CMH and NZ provided input on general practice aspects of study design, including in relation to educational materials for practices. JO, LN, BF, RW, AP, RG, JL, CF, NZ and NL contributed to the critical revision of the drafting and final approval of the manuscript. Funding This work was supported by a National Heart Foundation of Australia/ New South Wales Health Cardiovascular Research Network Research Development Project Grant (101133) with top-up funding to complete the study in rural NSW through an investigator-initiated grant from Pfizer. 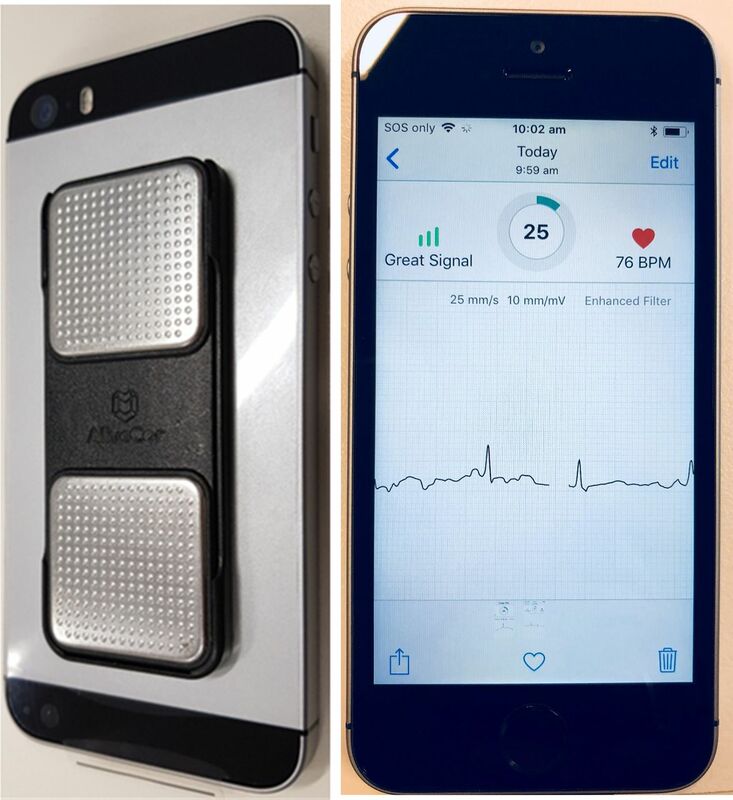 AliveCor has provided free Kardia devices for study purposes. JO is supported by an Australian Government Research Training Program (RTP) Scholarship. RW is funded by an NHMRC Early Career Fellowship (APP1125044). NL is funded by an NSW Health Early Career Fellowship (H16/ 52168). Disclaimer The funders have no influence on study design, data collection or the decision to submit reports for publication. Competing interests NL and BF report grants from BMS/Pfizer during the conduct of the study. RW and AP report other financial interests from George Health, outside the submitted work. CF reports personal fees from Pfizer outside the submitted work. LN reports grants from Pfizer/BMS and Boehringer Ingelheim outside the submitted work. BF reports prior fees and advisory board honoraria from Bayer Pharma AG, Boehringer Ingelheim, and BMS/Pfizer but for the past year has removed himself from pharmaceutical advisory boards and receives speaker fees only for accredited educational meetings. Ethics approval Approval for the study was received from the University of Sydney Human Research Ethics Committee on 27 February 2018 (Project no. : 2017/017).